Adam Watson is continuing to write, although now at a rate easier to keep up with. This review will bring us up to date. This book follows the pattern of many of his earlier books; a mixture of serious scientific analysis and the sort of observation that appeals to the layman, such as myself. The scientific analysis will be of interest to the scientific community and the anecdotal observations appeal to me, and probably, most of you. 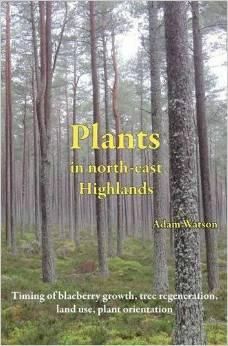 This book is really more of a collection of pieces rather a book covering the range of plants found across the north-east highlands. This does not detract, as it's still full of interesting observations and excellent photographs. As with Adam's other books, reading it will significantly increase your understanding of the mountain environment. The first chapter covers the timing of blaeberry growth. Not surprisingly, warm spring weather tends to produce early growth. The interesting part is the discussion on the effects of snow-lie. The benefits of snow lying over winter and protecting the ground and plants below are one of the reasons behind the fertile high Alpine meadows. It appears that it also influences growth in Scotland. The second chapter covers tree regeneration on moorland. It is particularly useful reading right now, given the controversy caused by the RSPB proposals to plant broadleaved trees at Abernethy to expand the existing area of Old Caledonian Pine Forest. The RSPB is happy with regeneration of Scots pines but considers that broadleaved trees need "artificial"help. Reading this chapter will help you to follow the ongoing scientific debate. The third chapter consists of a report critiquing a 1994 report on the findings from a Norwegian Tour to look for learnings relevant to "Reforesting Scotland". Without access to the original report, this section is difficult to read. However, there are plenty of interesting observations on climatic differences between Norway and Scotland. The fourth chapter is a short piece defending sporting estates against the charge of "land impoverishment". Not what you might initially have thought and very interesting to read! The fifth chapter is, in a way, the least scientific and probably most interesting of all. It talks of how to orientate yourself using lichen and moss growing on trees, and, to a lesser extent, alpine plants and ant hills. Very handy, if you get lost and have also lost your compass! It is an excellent example of Adam's huge observational prowess. The book includes some superb photographs to illustrate the names. These photographs are a delight in themselves. It is an absolute mine of information and well worth buying if only to save those all too often moments of embarrassment when talking with local people. Adam's books are for sale on Deeside. Deeside Books in Ballater has copies of all of them. Hilltrek in Aboyne, Braemar Mountain Sports and Dinnet Antique Shop have various copies. They are also available from Amazon. Publication of this book has been kindly sponsored by Bert McIntosh and McIntosh Plant Hire Ltd.